On Sunday 17th of February 2019 the participants of the 5th Gathering of the International Anarchist and Anti-authoritarian Radio Network that is taking place in Zürich, Switzerland will jointly produce at least 6 hours of live radio broadcast. The broadcast will cover wide range of topics from the perspective of anarchist and anti-authoritarian movements: presentations of local and international projects, groups/networks and activities/struggles; discussions on current issues; announcements of the upcoming protests/conferences/meetings/bookfairs; radical music and much more! There might be some pre-recorded interviews or presentation of pre-existing material such as statements or recordings. The participating projects (radio stations, radio shows and podcasts) are coming from different parts of the world so interesting and politically up-to-date program is inevitable! The programme will be mostly in English. You can listen to the online stream at the link below, and some of the local radio stations will also air it. 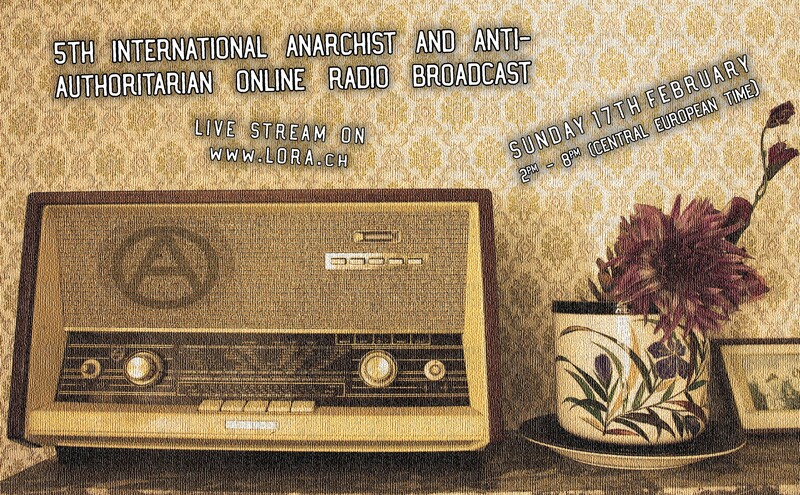 Live anarchist radio broadcast will be on air of Radio Študent between 14:00 CET* and 19:00 CET. Reporst from comrades from around the world about some of the latest attacks of different states on anarchists. We will hear from Asylo (Torino, Italy), about repression against anarchists in Russia, report on eviction of Klinika in Prague, Czech Republic. Finally, there will be an update from USA about J20 case.